When you were younger you would often be given clothes that were handed down and it was usually accompanied with the words “ well its new to you”. When I see a film that is remade from a foreign film and knowing how few may have seen the original, those words come racing my head, because well, it is in fact new to so many. For me it’s harder to duplicate something that has a certain cinema magic to it, but when it comes to something ordinary, I mean you can’t do any worse right? Well sometimes questions like that shouldn’t be asked, because it seems things can get worse no matter how new it may seem. Gloria (Gina Rodriguez) is a makeup artist in Hollywood, with some great ideas for her craft, unfortunately no one wants to hear about them. That doesn’t matter this weekend though, as she is heading to Tijuana to help her friend Suzu (Christina Rodlo) in the Miss Bala California beauty contest. Things start off as you would expect when two good friends reunite, but things go sideways for the girls while at a club when a group of shooters come looking for someone and they are caught in the crossfire. Gloria escapes but loses Suzu in the process and when she asks an officer about her, while claiming to have seen the shooters, she is taken to the men she was trying to identify. Gloria is scared, but the men, led by Lino ( Ismael Cruz Cordova) convince her that if she helps them she will see her friend again alive. That help soon leads to a more tangled web and soon the D.E.A. is recruiting her and she has to walk an even more narrow line if she wants to live and see her friend again. Based on the 2011 film of the same name, the new incarnation has a lot of the same feel, minus the originally. And of the many things wrong with this version, including the very unpractical clothing options, there are some moments that rise above. Director Catherine Hardwicke (Thirteen) does her best to make something out of nothing, mainly the script by Gareth Dunnet- Alcocer which moves at a snail’s pace and seems to really have nothing that resembles a story. With every turn spelled out and an all too predictable ending, it’s really hard to get behind this film. 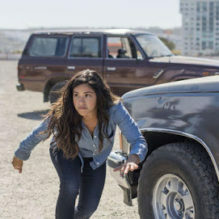 Hardwicke is not the only bright spot as Gina Rodriguez proves she can carry a feature film in a role she looks very comfortable in. Those are the only two things Miss Bala has going for it, the rest is just backwards in quality. Somethings should be retold, so that others who would not normally get a chance can see a good story unfold before their eyes. This was not one of those times, which maybe had good intentions but lost its way to the screen. Seek out the 2011 version if you want to see the better version of this film, but if you don’t want to bother with that, don’t bother with this version either, because there’s just no beauty in this one.